The government is likely to reduce the existing nine different rates of Value Added Tax (VAT) to six in the budget for fiscal year (FY) 2018-19. It may also revise the existing rate of Advance Trade VAT (ATV) upward by one percentage point to 5.0 per cent. All imports are subjected to ATV barring a few, including the essential ones. ATV is a VAT determined at the business or non-production stage. VAT officials collect the ATV at the time of import of products or services. Officials familiar with the fiscal measures said the proposed changes would help the National Board of Revenue (NBR) collect a significant amount of revenue in the upcoming fiscal year. Finance Minister AMA Muhith is set to announce these two major changes on June 07 when he unwraps the budget for the next fiscal year. Officials said that the existing VAT rates above 10 per cent would remain unchanged in the budget. The tax authorities may merge some of the VAT rates that are between 1.5 per cent and 10 per cent. 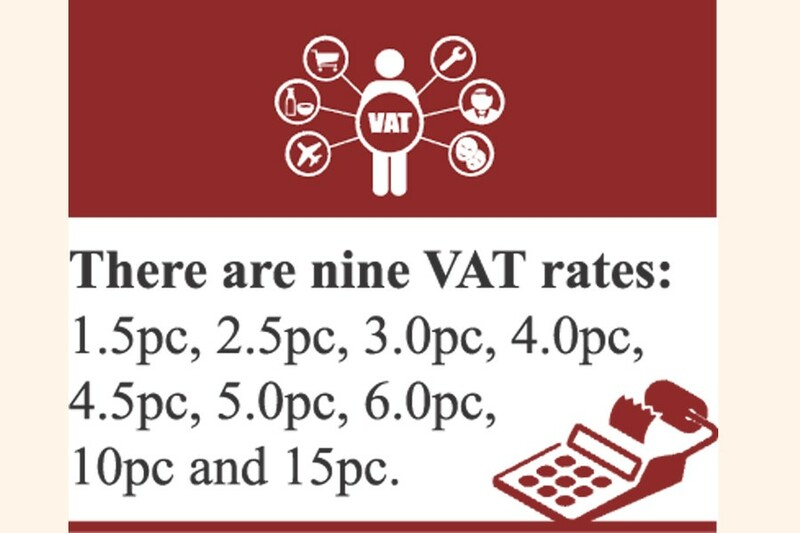 Currently, there are nine VAT rates: 1.5 per cent, 2.5 per cent, 3.0 per cent, 4.0 per cent, 4.5 per cent, 5.0 per cent, 6.0 per cent, 10 per cent and 15 per cent. Earlier, Muhith had instructed the NBR to explore the possibility of merging the existing VAT rates with two rates. In line with the instruction, the VAT policy wing conducted a detailed analysis on this issue. The wing found the job too difficult to accomplish. Also, they feared that the sudden changes might anger businesses. A senior VAT official said making only two VAT rates may affect the businesses as a number of sectors still deserve the concessional rates of VAT. "We may continue with the multiple rates of VAT this year. But the number of multiple VAT rates would be gradually reduced," he added. Officials said tax on tobacco items would increase significantly in the upcoming budget. The rates of package VAT for small businesses and excise duty for bank depositors is likely to remain unchanged in the budget. The NBR may impose VAT on a number of products that are enjoying tariff value, according to officials. It may also withdraw VAT exemptions from a number of items and include those in the list of products under tariff value. Officials said the VAT collection target will be higher in the upcoming fiscal among the three wings of the NBR. The new VAT and Supplementary Duty (SD) Act 2012 is expected to come into force from July 2019. The government would try to bring down the rates of VAT in phases to ensure the smooth implementation of the new law. Experts said too many VAT rates in the country create the scope for distortion in the market. In the new VAT law, there is a uniform rate of VAT at 15 per cent on all products and services. However, the enforcement of the new law has been deferred by two years until July 01, 2019. They said it may not be possible for the government to introduce a uniform VAT rate under the new law.